So the post-race bender/emotional hangover is finally over. Over, you say? Were you wondering when it started? Perhaps my complete silence on my blog for the past 2 weeks seems so typical of me, moving with ADHD speed from one thing to the next, completely forgetting what’s important? I don’t care what ANYONE tells you about wrapping up their racing season, or finishing their “A” race. It’s depressing. And I have read a lot of blogs out there that confirm my feelings. And pretty much none who don’t, perhaps due to selective depressing reading. I gave myself a week to eat what I wanted, drink what I wanted, and get the funk out. Then I planned to start on my new goal series, “Christmas Present to Myself”, which would be to lose that last 10 pounds to get to my goal weight, and tone up the core so it’s bikini ready. For the first time. Ever. 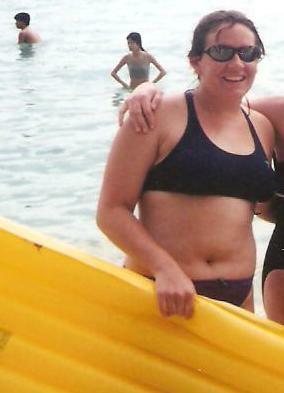 Because you can hardly count the body I used to sport my Speedo workout bikini in Hawaii my senior year of college as “bikini ready”. Circa 1998. Note to self: if you need an inflatable raft to cover yourself, maybe you shouldn’t wear a bikini. Since I was so excited to “do what I wanted”, I went to a TRX class, and besides reminding myself of all the things I love to hate about TRX, I ended up not being able to sit down without assistance from my upper body for about 5 days. Yea, I am talking to you, track lunges and jump squats. So that kind of hampered the “good start” I was preparing myself for last Monday. Last week, I felt better, had a week of good workouts, felt completely engulfed by work (like, who can manage to work only 15 hours a week but end up at campus 5 days a week?) and continued some gluttonous eating and over-consumption of adult beverages. The realization hit me that losing weight is HARD. I started doing a bit of wallowing about how I ever achieved weight loss goals in the past and anxiety about how I could ever do it again. I started thinking about how I could get help, how I could cut corners, or what I could do to make it go away without having to do the work. Of course, 2 really inspirational (as always) messages popped up in my inbox yesterday from 2 of my fave blogs, Swim Bike Mom and Average Moms Wear Capes. I feel it is essential for me to read something uplifting and positive every day, and those definitely made me feel better. So once I get my food logging and weight loss underway, I am going to take a cue from Joel Runyon (my cyber crush!) or my friend Lonnie and get working on that 6 pack. One thing that stood out to me from both of their stories is that you can’t just do a million situps and hope for a 6 pack- you have to actually lose the weight. As my yoga teacher says, “We all have a 6 pack.” Mine is just waiting to be uncovered, I guess. Speaking of my yoga teacher, she said something that really resonated with me today as I reflect on my mental state of mind. She said, “Depressed people are living in the past. Anxious people are living in the future. People who are at peace are living in the present.” So I choose today, to live in the present, and keep moving ahead, one day at a time.